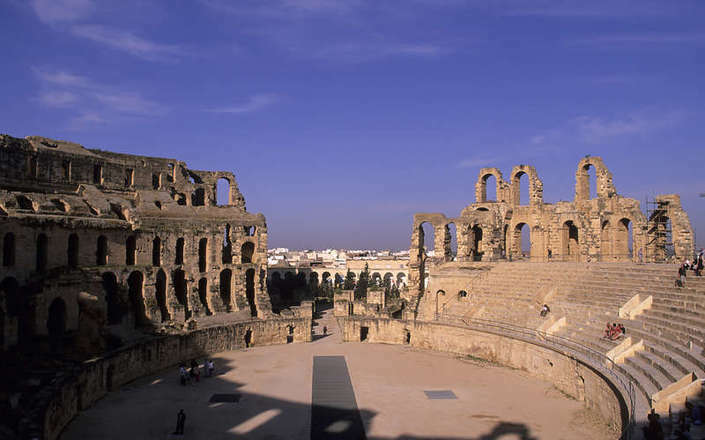 Some of Tunisia’s finest Roman ruins are to be found in the central part of the country. 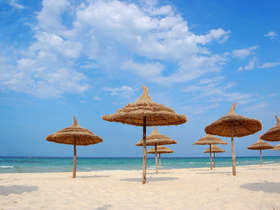 Access is either from Kairouan or Sousse or when travelling from / to Tunis into central Tunisia. 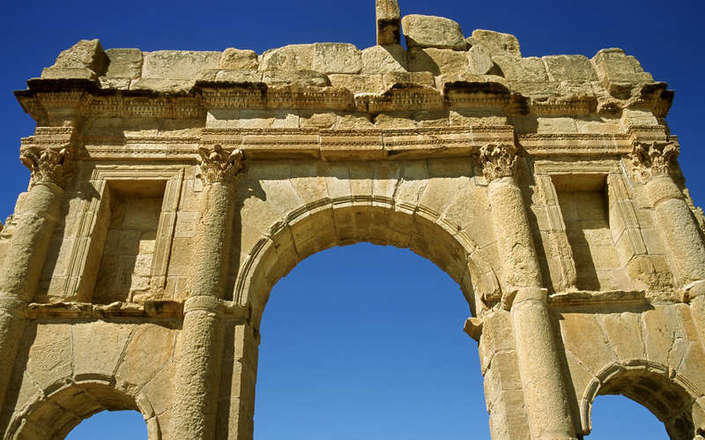 El Djem (ancient Thysdrus) means ‘the place where the lions hide’ in Arabic, a distant memory of the ‘games’ once held in the city’s amphitheatre. 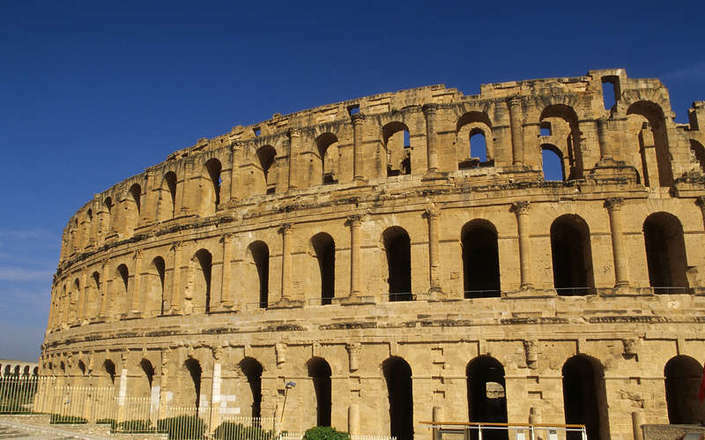 It is a magnificent structure in a better state of preservation that the Coliseum in Rome. 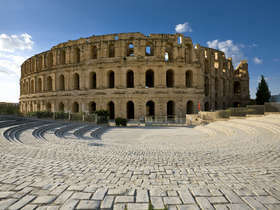 El Djem’s amphitheatre once held 30,000 spectators and has huge outer walls rising to a height of three stories. Below ground the visitor can walk through the tunnels and dungeons that once held wild animals, gladiators and criminals prior to them being delivered into the arena. 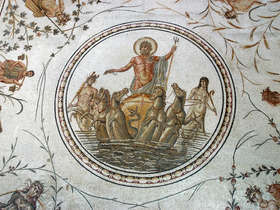 El Djem’s museum houses a collection of mosaics that is second only to that of the Bardo. 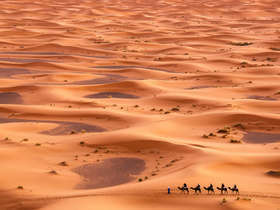 Sbeitla (ancient Sufetula) was founded in the 2nd century AD and is located in the Tunisian pre-desert. The city’s substantial remains are built from a beautiful honey-coloured stone and include one of the most instantly recognisable views in the country: that of three well preserved Capitoline temples facing a Triumphal Arch of Marcus Aurelius. Thuburbo Majus is situated amongst a beautiful rural landscape and probably originated as a Berber settlement. The town flourished as a market centre and provides a good example of a typical African provincial city. Thuburbo Majus’ principal monuments date from the 2nd century AD when it was given the privileged title of Colony by the emperor Commodus. Maktar (ancient Mactaris) was founded by a Numidian king in the 2nd century BC in a spectacular mountain top location. 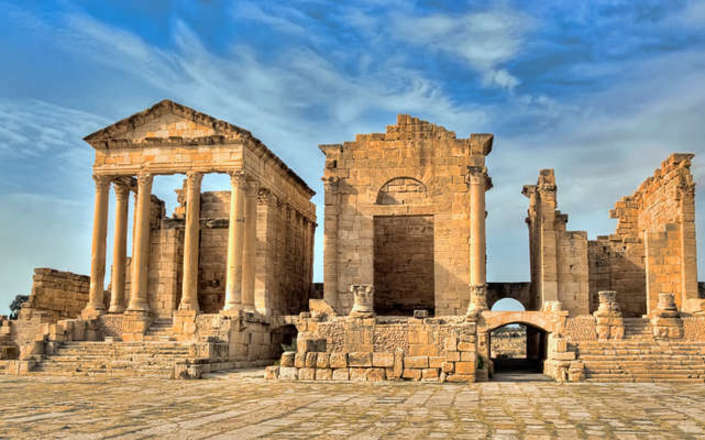 The impressive ruins include a fine rectangular Forum on the south side of which is located the very well preserved Arch of Trajan; the attractive ruined Schola; and a Libyco-Punic Mausoleum in the form of a obelisk. The beauitful honey-coloured ruins include the stunning sight of the three well preserved Capitoline temples. A magnificent structure that is in a better state of preservation that the Coliseum in Rome. A fine example of a typical African provincial city. Thuburbo Majus’ was honoured by the emperor Commodus.